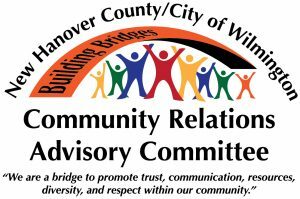 NEW HANOVER COUNTY, NC – The New Hanover County/City of Wilmington Community Relations Advisory Committee will hold its monthly meeting on Tuesday, January 22, 2019 at 5:30 p.m. The guest speaker will be Mebane Boyd, chair of the New Hanover County Resiliency Taskforce. The meeting will take place at the downtown Public Library, located at 101 Chestnut Street in Wilmington, in the New Hanover Room. The committee was established by the New Hanover County Board of Commissioners and Wilmington City Council for the purpose of addressing community issues involving prejudice or discrimination on the basis of race, national origin, creed or religion, age, gender, sexual orientation, disability or medical condition; informing the Appointing Authorities and other organizations of their findings; and making recommendations, in an advisory capacity, to the Appointing Authorities and other organizations, as necessary. Learn more about the Community Relations Advisory Committee here.